SAM pyramidal RF absorber is impedance matched for use over ferrite tiles. 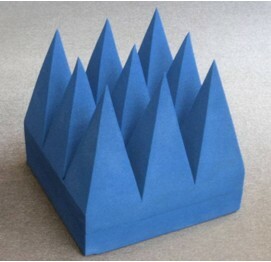 SAM pyramidal RF absorber provides excellent performance over a very broad frequency range and is suitable for use indoors over ferrite tiles. Typical applications include RF anechoic chambers, antenna test facilities, radar test facilities etc.